I’ve done swaps. I’ve done bee blocks. And I’m in my very first online quilt bee. And as of today, I’m joining in a quilt-along. I poked around my fabric stash and came up with these. And I’ll most likely use Kona Snow for the background. I’ll pick the binding out later! I’m planning on making up the mini. And I’m really doing it as a ‘back to basics’ exercise. My mystery quilt top is craptastic and its craptastic because I was sloppy. With the smaller size I should be able to take my time and do things right and still keep up with the group. And my other on-going sewing projects. I know, I know. I already told you I am committed to sewing 12 dresses this year. And I’ve yet to begin on dress #1. And I haven’t finished the Beignet either. And I just got the fabric for January Block #2 for the Moody Blues Bee. Oh, and I joined in Round 2 For the Love of Solids swap also. Too much? Maybe. But I’m way more productive if I have something to work towards. Aimlessly wandering into my sewing space, looking around for something to do isn’t going to work anymore. What about you? How many projects do you have going on at once? 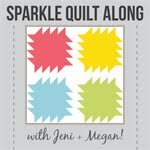 Good luck on your first quilt-a-long! I have yet to finish one on time, but I am going to jump into the same one as you and make up the mini. I love the fabrics you choose as well. Your colors are beautiful and go together so well. I’m also doing the quilt along but haven’t chosen my fabrics yet.